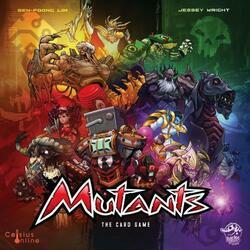 In Mutants, 2-4 players must mix genomes to create the ultimate warriors and demonstrate their prowess in the arena. By dominating the arena and freezing your most precious mutants, you gain prestige. And whoever has the most wins. Each round, the players go through a series of turns until they have used all the cards in their hand. At the end of the game, the player closest to the top of the arena scores prestige, which varies according to the progress of the game. Players then reveal their archives and gain prestige through their frozen mutants. A detailed tour: you will do three steps. First, you will look to see if you have atomized your competitors, you will prepare your mutants in play, then you will do one of three things: Reproduce: win a new mutant card, to use this turn. Incubate: prepare a mutant card to use the next turn in combat. Deploy a mutant: play a mutant from your hand in your active mutant slot. Mutants was funded on the Crowdfunding Kickstarter (See the campaign) platform on the 20 November 2018, the campaign lasted 21 days. 1,385 people helped funded the game, whose the amount requested was $10,000.00. Thanks to these 1,385 people the game could be funded up to $92,979.00, ~929.79%.